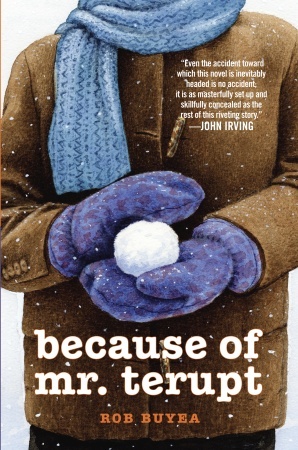 *At the opening of Because of Mr. Terupt, Peter offers, “It’s our bad luck to have teachers in this world, but since we’re stuck with them, the best we can do is hope to get a brand new one instead of a mean old fart.” (p. 1). For what reason do you think Peter finds hope in having Mr. Terupt as his teacher? Why does he choose to push his boundaries as a means of “testing” him out? Based on your personal experience, do you agree with his assessment about new vs. old teachers? Why or why not? -Old teachers who have been at the district know all of the rules. Mr. T. doesn't know the reasons that things work. -New teachers are better than old teachers because you can learn their new rules. -I think that Peter wanted a new teacher because with rookie teachers, they don't know your tricks that the old teachers know. You can get away with more. -It's hard to pick between both. Old teachers know the rules and know what's going on. New teachers are good but they don't know why. -Old teachers know what's actually bad and what's actually good. -I think that Peter likes the rookie teachers better because they don't know the rules and they don't know what they're going to get from the students. *Describe Mr. Terupt. What makes him a dynamic person? Is he the type of teacher you would want? Why or why not? -I think Mr. T. is special. -I would love to have Mr. T. because he's nice, cool and deals with bullies. He's really cool with how he deals with everything in the book. -I would like Mr. T. because he knows how to deal with people, if they're being mean. He deals with Lexie and Peter really well. -I would love Mr. T. because he's an inspiration to little kids. Some teachers would say "stop picking on so-and-so" but he teaches them examples of how to be better. -I would love to have Mr. T. because he knows how to deal with kids. Even though he's a rookie, he keeps his eyes open. He gives examples to the kids of how to be better. *Consider the seven students/narrators of the novel: Who did you like the most? The least? For what reason? Of all of the characters, who did you feel was most similar to you due to his/her personality or experiences? -My favorite character was Danielle. I liked her because she had to fight through a lot of things in her life. Whenever she told a story, you could feel her pain. The person I liked the least was Luke because of him always saying dollar words. -I liked Jeffrey the most because of his back story (Evan, can you let me talk!). I liked how the author added the story of his brother. I felt like Luke was pretty boring. -I think that it's hard to choose the best character because they all brought out different emotions in the story. Jessica was probably my favorite because she tied everyone together. Peter was kind of boring. -Out of all of them, my favorite would have to be Jeffrey because he hates school but then does Collaborative Classroom. I didn't have a least favorite. -Anna and Jessica were my favorites because they're shy and bookworms. Peter and Alexia were my least favorite. -My favorite was Jessica. My least favorite was Lexie because she's mean. The character I'm most like is Anna. -My favorite character was Anna because she sort of started out with no friends. My least favorite character is probably the Principal because she's funny. The character who is most like me is Anna. -My favorite was Peter because he's funny and likes to pull pranks. I don't have a least favorite. Peter is the most like me. -All of the characters have such different personalities so I can't choose. My least favorite was Peter because even though he thought it was an accident and he was the one who hit Mr. T. with the snowball. The one most like me is Jessica because she's smart and I'm smart. -My favorite character was Peter because he was funny. My least favorite character was Luke because he was pretty boring. The dollar word thing was annoying. -The person who is most like me is Lexie. A little bit of Anna and a little bit of Jessica. My least favorite is Luke because he's boring. My favorite is Alexia without the bully part. The Book Club selection for April is Wonder by R.J. Palacio. "Ten-year-old Auggie Pullman, who was born with extreme facial abnormalities and was not expected to survive, goes from being home-schooled to entering fifth grade at a private middle school in Manhattan, which entails enduring the taunting and fear of his classmates as he struggles to be seen as just another student. "- summary. The club will meet at 3:00 p.m. on Wednesday, April 4th in the Meeting Hall. Books have been ordered and will be available for pickup behind the Circulation Desk. Please be sure to sign up for Book Club so that Miss Lisa knows how many snacks to buy!